1. Don't feel like rubbing two sticks together? Grab yourself some of these Vintage Camp Safety Matches! 2. A brand new card by debuting Red Cap artist, Sarah Burwash. Her line will be debuting at the New York Gift Show this month! 4. We love these card sets from Scout's Honor Co. This design is one of four in the Bait + Trail Cards set. 6. The perfect old-fashioned-looking Outdoor Enamel Coffee Pot from REI! 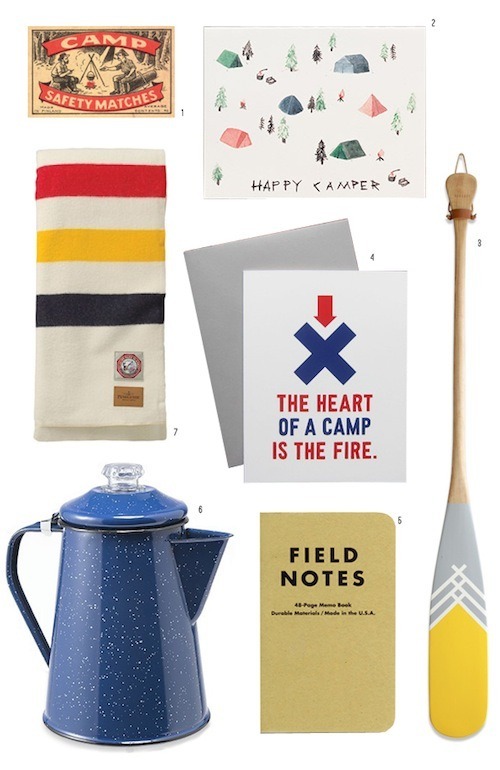 For more camping fun, check out our new Happy Camper Pinterest board!